This summary is an artistic rendition of major historical periods for the community of Bloomington. Each image is a graphical representation of everyday life and events that could have been seen during that specific time. 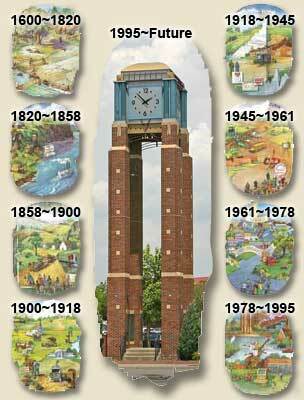 The images are watercolor depictions of eight bronze historical plaques located on the Bloomington History Clock Tower at the corner of W. 98th Street and Lyndale Avenue South. 1945 - 1961: Bloomington, "All-American City"